Salad Days is a hydroponic farm that specializes in growing pesticide-free produce and is able to supply warm season crops such as several varieties of tomatoes and lettuce nearly 365 days a year. Family owned and operated by Jamie Redmond and Leigh Bailey. 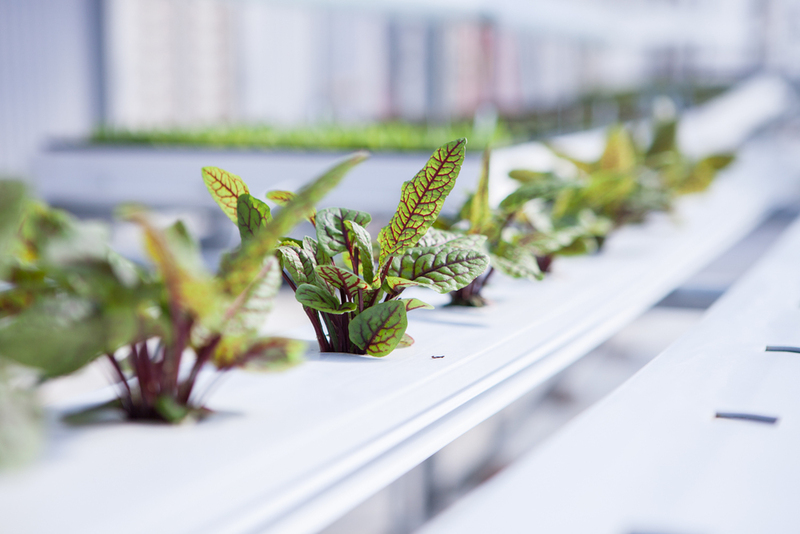 Hydroponics is a method of growing plants using nutrient rich water in place of soil. Water usage is minimal making this method easily sustainable. The sterile, soil-free growing process greatly reduces the risk of pathogens and soil-borne diseases. Eliminating manure as a fertilizer cuts the risk of food borne illnesses, such as E coli and salmonella, from consuming fresh vegetables. 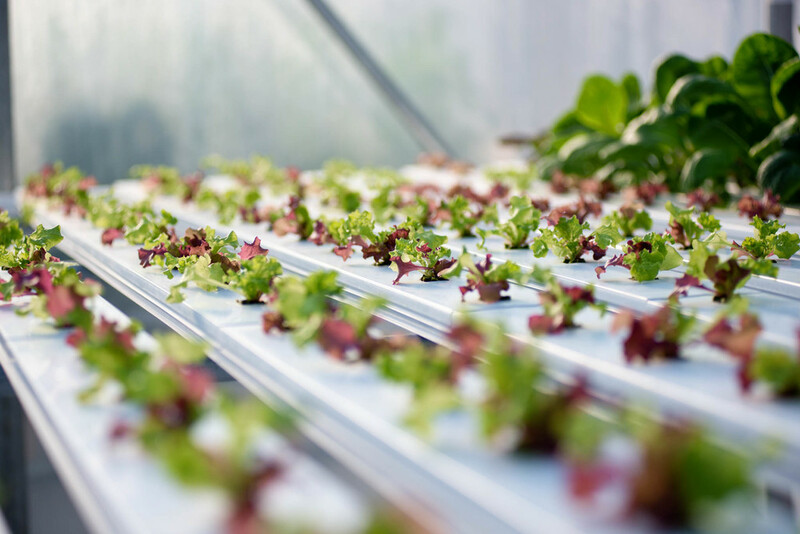 Hydroponics does not result in any soil erosion, nor the loss of precious soil nutrients, while allowing complete control over plant nutrition for optimal flavor and quality. 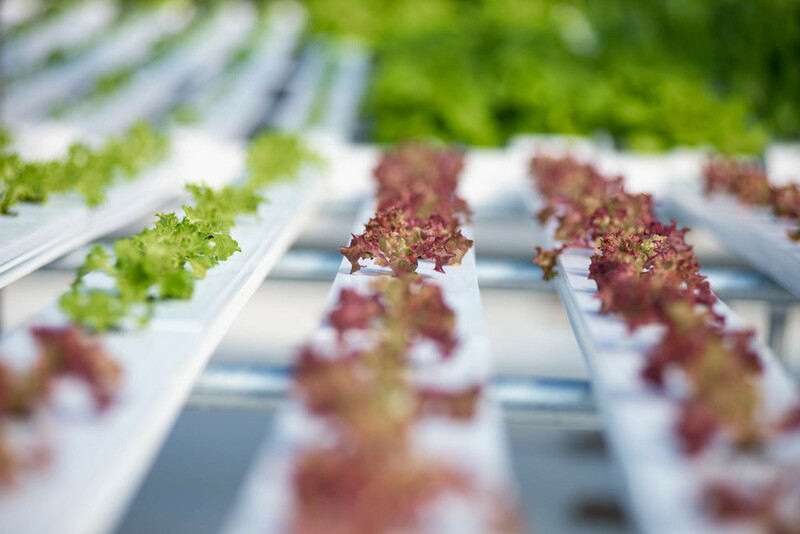 Our specially designed re-circulating hydroponic methods save land, conserve water, eliminate agricultural runoff and chemical pesticides, and offer the benefits of efficient, high-yield, local, and year-round food production. Salad Days uses far less water than traditional field-grown agriculture. Our water is recycled and used multiple times, reducing the amount necessary by as much as 80% over crops grown outdoors. Salad Days can produce the equivalent of approximately 5-6 acres of field grown produce in our 18,000 square foot controlled environment greenhouse. This keeps our land use requirements at a minimum. Greenhouse grown produce is much less susceptible to pests & disease but when the need arises, Salad Days uses beneficial insects, like ladybugs & lacewings, to combat the harmful ones instead of using harsh chemical pesticides. Our tomatoes are pollinated by our resident Bumble Bees. Crops are grown, cared for, and harvested to achieve optimum taste and nutrition. Our products are often harvested just a few hours before they reach a restaurant plate or supermarket shelf, ensuring absolute freshness and nutrition. Our proximity to our customers ensures that our produce does not spend days on a truck in transit but instead arrives at its peak of freshness. Salad Days' stringent food safety plans have been developed according to the USDA's Good Agricultural Practices (GAP) and Good Handling Practices (GHP) guidelines to ensure product safety and eliminate potential for product contamination. We are GAP/GHP certified and are routinely audited by the USDA. Our clean growing environment minimizes the risk of food-borne diseases. Salad Days likes to think of our produce as “Better Than Organic.” By this we mean that by not using animal waste fertilizers, we have reduced the risk of contamination by bacteria like E. coli & Salmonella. Our greenhouses keep animals from entering the production area and our clean controlled environment means peace of mind for our consumers. Growing indoors protects our produce from bad weather and temperature swings that can cause blemished vegetables, short supply, and wild price fluctuations. Salad Days will be growing high-quality produce year round. BY THE TIME MOST PRODUCE ARRIVES AT YOUR SUPERMARKET IT'S TRAVELED CLEAR ACROSS THE COUNTRY. SALAD DAYS GROWS PRODUCE LOCALLY YEAR-ROUND, SO IT’S FRESHER, TASTIER, AND MORE NUTRITIOUS. PLUS, OUR PRODUCE IS NON-GMO AND NEVER SPRAYED WITH PESTICIDES. Leigh and Jamie got married in 2011 and decided that after working in real estate for over 60 years combined, it was time to embark on a new career adventure. They share a love of the outdoors, everything from hunting to gardening, so that was a criterion in their search. 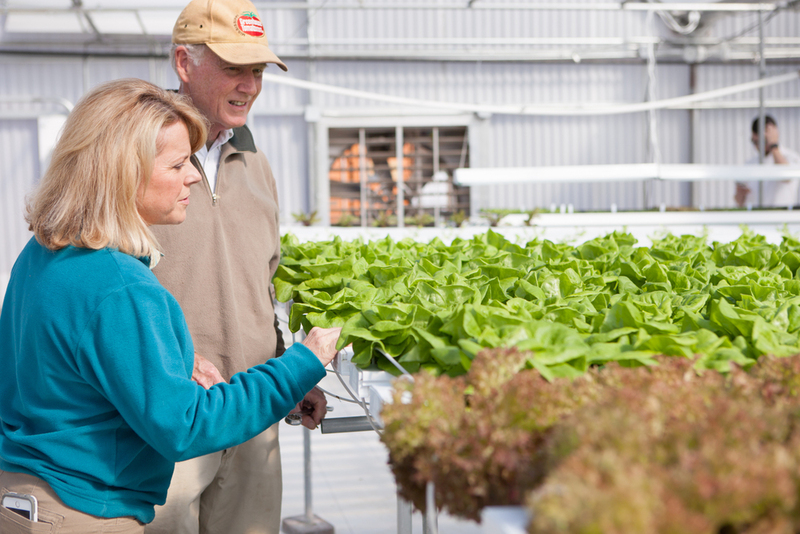 In 2012, after looking at several options, they decided on hydroponic farming. They began educating themselves by attending several courses and workshops, as well as visiting other growers in Mississippi and other states including Louisiana, Arizona, Virginia, and Maryland. They chose the town of Flora, MS as the home for Salad Days and are excited about providing healthy vegetables for this community as well as the greater Jackson area. Ethan was born in Jackson, TN and raised in Alcorn County, MS. He attended Northeast Mississippi Community College and graduated from Mississippi State University with a B.S. in horticulture in December of 2015. He joined our team in January of 2016. His interests have included music (percussion), history, and all things plants. From a very young age he has had his hands and thoughts on plants, which made his entry into Controlled Environment agriculture a natural choice when choosing a career. Ethan and his wife, Seleigh, live in Flora, MS.
We provide our customers a year-round, local supply of premium quality, pesticide-free produce grown under the highest standards of food safety and environmental sustainability. Salad days offers several tomato varieties such as Beefsteaks, Heirlooms, and an Artisan cherry mix. Our tomatoes are rich in Vitamins A and C and contain lycopene, a vital antioxidant. Our customers insist that our tomatoes have a true summertime taste that is second to none. We grow a variety of lettuces and herbs. Our Bibb, also known as butter lettuce, has a tender buttery texture and a sweet flavor perfect for salad, sandwiches and wraps. Our spring mix includes a variety of textures and colors such as Red and Green Oak Leaf, Lollo, and Sweet Crisp. 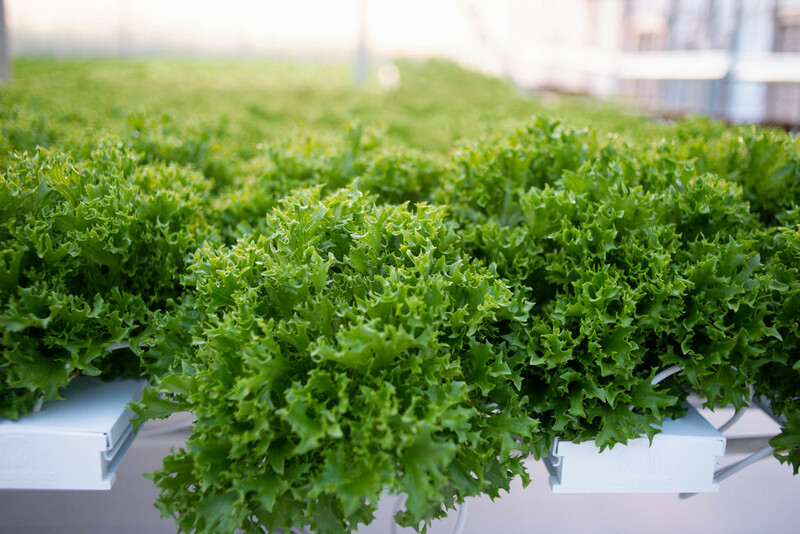 All of our lettuces are nutrient–rich and sold with roots for an incredible shelf life. Once you try it, you'll be hooked. Where to find our produce. We've been fortunate to be mentioned several wonderful media outlets.